Before I sound like Mrs. Scrooge right out of the starting gate, let me say that I fully believe in the magical power of toys. Not just to keep the little ones from assaulting each other delighted for hours, but also for sparking their imaginations and sharpening their capabilities. However, few things are more disheartening to me than a trip to Toys R Us and its generic cousins. Vast and charmless expanses where I’m surrounded by neon-colored, easily breakable, cheap-plastic contraptions that will run down their batteries just as quickly as my nerves from the incessant squawking and flashing, which toy manufacturers have programmed us to believe are necessary for children’s enjoyment and development. With all due respect to Sesame Street, the absolute worst toy I’ve ever purchased for my children was a Talking Elmo doll. It was an impulse purchase–the little red monster was staring us down as we innocently made our way up the aisle at a big-box store. Suffice it to say, I was too weak that day to fight it off. Not only did this particular Elmo eat batteries as ravenously as Cookie Monster gobbles up cookies, but it also took a huge bite out of my children’s imaginations. They would just sit there, totally zombified, uninterested in other toys being offered, while Talking Elmo blathered the same three (painfully unfunny) joke-stories over and over, and mechanically wobbled up and down on his little plastic stool. When the batteries wore down, I was elated. The kids lost all interest in the toy, which soon found another home far from our own. (Thank you, local firefighters, for your toy collection bin!) The kids never even wondered where Talking Elmo went. After we parted ways with Talking Elmo, I started to seriously rethink toys–and not just from the wasted money standpoint. First of all, my children had way too many toys–I’d even broken a pinky toe tripping over a pile of them. But second, and more importantly, what value were these toys bringing to my children’s lives? I was reminded of an inspiring little book that I’d read when my first child was still a baby, called Trees Make the Best Mobiles: Simple Ways to Raise Your Child in a Complex World by Jessica Teich and Brandel France de Bravo (St. Martin’s Griffin, 2001). In it, the authors write, “The more active or complex the plaything, the more passive your baby will become.” Children are instinctively creative and adventurous. They want to build and create their own masterpieces, not have the masterpieces arrive on their doorstep, already built for them. If you’ve ever watched little kids at the beach, you know that they can spend hours constructing the most elaborate sandcastles, complete with moats, dungeons, and towers, even if you’ve left the pail and shovel at home (woops!). I’ve also been heavily swayed on my path to fewer and better toys by the book Simplicity Parenting: Using the Extraordinary Power of Less to Raise Calmer, Happier, and More Secure Kids by Kim John Payne with Lisa M. Ross (Ballantine Books, 2010). The authors convinced me to dramatically weed out my children’s toy collections, so there was more open space to play and fewer choices to overwhelm them. I started by storing some toys in the basement, but when I realized the kids didn’t even notice the missing toys, I gradually moved the boxes up and out, to other homes. The authors were right: The kids had much more focused attention and enjoyment with the toys that stayed (and I didn’t break any more toes). 1. Assess your toy collection. We lined up all of our kids’ toys from one end of the upstairs hallway to the other, like a big parade. Frankly, it was a shocker, as we have a long hallway and some of the toys were piled up to make them all fit the length of the hallway. 2. Keep classic toys that rely on your child’s imagination. Legos, simple wooden blocks, musical instruments, and art supplies are always winners. Perhaps even better? The back yard. You can’t beat the pricetag. 3. Get the whole family on-board with a yard sale. I recently wrote about the lessons we learned at our spring yard sale. It’s so liberating to purge your stuff all at once. If a yard sale won’t work for you, seek out the toy donation bins in your area, or check with your pediatrician or dentist to see if they’d like any extras for their waiting rooms. Also, libraries often will accept puzzles. 4. Practice your resolve at the store. 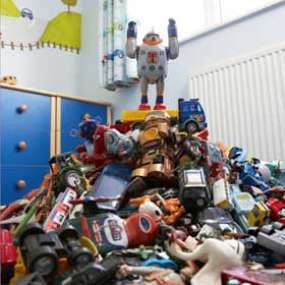 If a simple “no” won’t work, ask your kids which of their toys they’re willing to donate to make room for the new one. Works for us– suddenly, our kids become inseparably attached to the collection they’ve already got waiting for them at home. My kids are also budding environmentalists (their mom has a green blog; it’s bound to rub off on them! ), so when they pick up some cheap plastic thing at the store, I just say, “Wow, think of all the pollution that toy created when it was made!” and they drop it like it has cooties. 5. Avoid tie-in merchandise. Disneyland is great for a visit and Nick Jr. has some cute TV shows, but don’t get sucked into the marketing vortex of licensed and branded toys. Most times, these are not high-quality purchases, and the characters already have their own fully developed stories. Let your kids form their own adventures with “no name” toys. 6. Consider more “non-toys” for toys. If you’ve ever given a baby a wooden spoon and a pot to bang on, or given a kid a big box from an appliance delivery and some magic markers to decorate it, you already understand this point. Kids like the challenge of making something from nothing. 7. Repurpose grown-up things. My daughter has one of those big plastic kitchens (which I wouldn’t buy at a store, but I rescued in almost-new condition before the garbage men got to it in our neighborhood). She uses cast-offs from our actual kitchen (an old teapot that had quit whistling, pans that have lost their coating, an old set of utensils) instead of pre-made kitchen toys. “Real” stuff just feels better in little hands, and using “grown-up” things enhances the experience of pretending. 9. Dress-up Time. Few things entertain my children more than playing dress-up with grown-up clothes. Put a box aside for your kids, filled with some old hats, scarves, sunglasses, and costume jewelry. Again, “real” stuff tends to be more fun for kids than cheaply made dress-up items from the dollar store. 10. Give experiences instead of things. As I wrote in a post called The Gift of Time, love and attention are the most precious gifts of all. Give those in abundance. And if you see a Talking Elmo doll, just keep on walking!